This form is provided to an organization that has been asked to arrange a Major Event Meeting for an upcoming program or event on campus. The information supplied on this form will help guide our meeting and address any immediate questions regarding colleagues on campus who may need to attend. The Husein-Unternaher Service Event will be on Friday, April 26th from 1:00pm-3:00pm at the Akron-Canton Regional Foodbank. Check-in will occur at The University of Akron's Jean Hower Taber Student Union first floor atrium (PNC Bank lobby) beginning at 12:30pm. Shuttle busses will transport participants from the Student Union at 12:45pm and 1:00pm. The shuttle bus will return participants to the Student Union at 2:45pm and 3:00pm. The Marketing Area in the Department of Student Life provides the creation of webpages and updates to current pages, as needed by entities within the Department of Student Life. We ask for your patience as we work to fulfill your needs. Due to the timeline needed to create a webpages or fulfill updates that may needed, your request is needed at least 25 business days prior to the final launch date of your page. 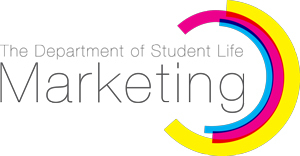 The Marketing Area in the Department of Student Life provides design services free of charge to registered student organizations at The University of Akron. The Marketing Area also designs the majority of marketing pieces for the Department of Student Life. Please know that our designers are talented students studying here at the University and work to staff our office between their classes. We ask for your patience as we work to design a poster or print project that fits your needs. Our area does not provide printing services, but would be happy to offer suggestions on areas to print your materials. Due to the timeline needed to design a piece and work with you to finalize a project, your request is needed at least 25 business days prior to your anticipated marketing route advertising. Each project has the opportunity for 6 rounds of edits. For approved rush requests, there will one be 1 round of edits. So, you've checked out OrgSync and can't find the group you're looking for...and you're ready to start your own! The SOuRCe staff is here to assist you in forming and approving your proposed organization. Before you start the process in totality, please complete this form so we have a better idea of the group you wish to form. Once your form has been received by the SOuRCe, a member of our staff will review your proposed organization to validate that a similar group is not already established on campus. Our staff will then communicate next steps with you based on if the group will continue in the process. NSO Meetings (to explain the details of the process) will take place twice per week at pre-determined days/times. In order to continue in the process, you (or a knowledgeable representative of the group) must attend. After this meeting, your group has the freedom to begin the process. We recommend allowing 4-6 weeks for the process from start to finish (pending the pace of you and your group members). The New Student Organization Development Packet consists of nine documents. Groups interested in becoming a Club Sport organization must first contact the Manager of Club Sports at 330-972-7610. Groups interested in becoming a Law Organization must first contact the Assistant Dean of Law Student Affairs at 330-972-2682. Groups interested in becoming a Social Sorority or Fraternity must first contact the Assistant Director, Fraternity and Sorority Life at 330-972-7909. Any other questions may be directed to abeverly@uakron.edu. At this point in the NSO process, you've reviewed OrgSync to ensure there is not an organization similar to the one you wish to start....you attended a NSO Interest Meeting to learn about the process...you've met with the SOuRCe and have been working on compiling documents to start your new group. Now it's time to submit all of your NSO documents to the SOuRCe for final review and approval! Once your form has been received by the SOuRCe, a member of our staff will review your proposed organization documents to validate that everything is within the standards of the process. Our staff will then communicate next steps with you based on if revisions are needed or if the documents will be pushed to the next stage as-is. We recommend allowing 2 weeks for the process from the time you submit all needed documents until the time you receive confirmation of recognition from our office (pending there are no additional edits needed to your documents). Please check-in before you depart. This information helps us with tracking visitors for annual reports and budget requests. If you'd like to promote your upcoming event or program within our UA residence halls via the electronic posting areas, please complete this form. No other forms of marketing will be accepted at this time. Please make sure when you are submitting the event information that you are submitting everything at least 14 business days before the posting date in order to accommodate the current number of submissions! If your organization wishes to work with a new Campus Advisor, please complete this form. For questions regarding the role of a Campus Advisor, please see the Student Organization Resource Manual found under "Files" or stop by the SOuRCe and ask one of our knowledgeable liaisons! Any student organization wishing to utilize an outside contractor must complete this form at least 30 business day (4 weeks) prior to any anticipated event, program, or performance. Failure to do so, by either the organization or the vendor, may result in the inability to utilize an outside contractor, per University Department of Purchasing guidelines or cancellation of the event. If your student organization is contracting space off campus, please indicate "off campus request" for questions that do not apply. Student organizations are not permitted to enter into any type of verbal or written contract other than University Services Agreement. Please click here to review our policies prior to requesting a reservation in the Student Union. A confirmation of your space will follow in the form of an email, if your request can be accommodated. If the space you request is not available, your form will be "denied" with specific instructions/direction. This form is intended for UA Departments only (NOT STUDENT ORGS) By completing this form you are requesting the use of space in the student union or outdoors. Note: If your student organization is traveling between May 1st-June 30th, 2019, please contact Adam Beverly, Coordinator for Student Involvement at the SOuRCe, at abeverly@uakron.edu. This form is to be used to document your organization travel request for student organizations that are not seeking funding to assist with traveling. This form should be filled out at least 30 calendar days in advance of an anticipated trip. This timetable provides the SOuRCe with the necessary time to check Good Standing and properly inform your group of an approved travel. If you are looking for assistance with funding, you must submit a request through Budget Management System. This is found within your organization's portal - under "Treasury".